I believe that this is the key question for existing communities of faith in the Western world. Every day in the Western world there are 5000 less Christians. This means that the West needs to be re-won for Jesus Christ. But there is good news. Footholds and resources are already in place from which to begin. Transitioning established congregations is not an easy task—but it is an essential one as we seek to be faithful stewards of all that God has given. 1) Reintroduce the Apostolic story of Acts. At the Day of Pentecost (Acts 2), a small group of persons whom God filled with the Holy Spirit began to turn the world upside down. The Church launched that day in fulfillment of Joel’s prophecy was a movement of dreamers and visionaries empowered by the promised Holy Spirit from God. Don’t pass over the phrase dreamers and visionaries too quickly. In many struggling churches, the people of God have lost the capacity to dream of what God might do in and through the community. One of the first steps in transitioning to a missional model is to help followers of Jesus Christ to begin to dream again dreams shaped by the Scriptures. Struggling churches are merely seeking to survive. When followers of Jesus Christ under the guidance of the Spirit begin to dream again, they slowly begin to realize that survival isn’t a goal. Survival is a prison that keeps a group from living. The goal of the Church of Jesus Christ is life in relationship to God. Living may sometimes means dying. Following Jesus Christ involves living as though you have already died (Matt 16:24). A vital relationship with Jesus moves us beyond fear to follow Jesus into the world on mission. This is the source of life. Apostolic dreams lead to apostolic action. 3) Move God’s people from consumers of religious services to becoming collaborative influences for the Kingdom of God. Missional churches are not about providing programs/resources to meet “felt needs” as ends in themselves. Missional churches call people to convert to the Gospel. This involves a reorientation from a life focused on self to a life centered on following Jesus Christ. The people of God shift from consuming to becoming Kingdom-rooted entrepreneurs who seek to extend the influence and reign of God to the ends of the earth. Congregations shift from inviting people to have their needs met to unleashing people to change the world. Too many churches wait for people to show up at the door. Missional churches are not opposed to advertising or raising awareness of the community of faith, but they do not sit round waiting for the World to show up. Instead, missional churches collaborate and envision ways to engage new Social networks. This is a key shift. The World no longer serves as a threat from which followers of Christ flee. Instead, the World becomes the venue for life and service in God’s mission. By engaging the world, we recapture the biblical vision of reaching the ends of the earth with the good news. Need a curriculum that helps trains disciples for mission rather than maintenance. Check out Invitation. Invitation introduces the narrative framework of Scripture through the lens of mission, character and community. Participants in the study will discover the missional DNA of the Christ following movement and learn to find themselves in the story of God's mission for humanity and all creation. How do Spiritual gifts function in a missional community? Let's take a look at how the apostles described gifts in the house churches of the 1st century Christ following movement. NIV 1 Corinthians 12:4-11 There are different kinds of gifts, but the same Spirit. 5 There are different kinds of service, but the same Lord. 6 There are different kinds of working, but the same God works all of them in all men. 7 Now to each one the manifestation of the Spirit is given for the common good. 8 To one there is given through the Spirit the message of wisdom, to another the message of knowledge by means of the same Spirit, 9 to another faith by the same Spirit, to another gifts of healing by that one Spirit, 10 to another miraculous powers, to another prophecy, to another distinguishing between spirits, to another speaking in different kinds of tongues, and to still another the interpretation of tongues. 11 All these are the work of one and the same Spirit, and he gives them to each one, just as he determines. NIV 1 Corinthians 12:31 – 13:13 But eagerly desire the greater gifts. And now I will show you the most excellent way. 13:1 If I speak in the tongues of men and of angels, but have not love, I am only a resounding gong or a clanging cymbal. 2 If I have the gift of prophecy and can fathom all mysteries and all knowledge, and if I have a faith that can move mountains, but have not love, I am nothing. 3 If I give all I possess to the poor and surrender my body to the flames, but have not love, I gain nothing. 4 Love is patient, love is kind. It does not envy, it does not boast, it is not proud. 5 It is not rude, it is not self-seeking, it is not easily angered, it keeps no record of wrongs. 6 Love does not delight in evil but rejoices with the truth. 7 It always protects, always trusts, always hopes, always perseveres. 8 Love never fails. But where there are prophecies, they will cease; where there are tongues, they will be stilled; where there is knowledge, it will pass away. 9 For we know in part and we prophesy in part, 10 but when perfection comes, the imperfect disappears. 11 When I was a child, I talked like a child, I thought like a child, I reasoned like a child. When I became a man, I put childish ways behind me. 12 Now we see but a poor reflection as in a mirror; then we shall see face to face. Now I know in part; then I shall know fully, even as I am fully known. 13 And now these three remain: faith, hope and love. But the greatest of these is love. NIV Romans 12:3 - 9 For by the grace given me I say to every one of you: Do not think of yourself more highly than you ought, but rather think of yourself with sober judgment, in accordance with the measure of faith God has given you. 4 Just as each of us has one body with many members, and these members do not all have the same function, 5 so in Christ we who are many form one body, and each member belongs to all the others. 6 We have different gifts, according to the grace given us. If a man's gift is prophesying, let him use it in proportion to his faith. 7 If it is serving, let him serve; if it is teaching, let him teach; 8 if it is encouraging, let him encourage; if it is contributing to the needs of others, let him give generously; if it is leadership, let him govern diligently; if it is showing mercy, let him do it cheerfully. 9 Love must be sincere. Hate what is evil; cling to what is good. NIV Romans 1:11-12 I long to see you so that I may impart to you some spiritual gift to make you strong-- 12 that is, that you and I may be mutually encouraged by each other's faith. NIV 1 Peter 4:7-11 The end of all things is near. Therefore be clear minded and self-controlled so that you can pray. 8 Above all, love each other deeply, because love covers over a multitude of sins. 9 Offer hospitality to one another without grumbling. 10 Each one should use whatever gift he has received to serve others, faithfully administering God's grace in its various forms. 11 If anyone speaks, he should do it as one speaking the very words of God. If anyone serves, he should do it with the strength God provides, so that in all things God may be praised through Jesus Christ. To him be the glory and the power for ever and ever. Amen. 1) Avoiding the Disease of Conceit. A consistent theme running through several of these texts is the danger of individual members thinking too highly of themselves. Nothing kills community more than this. The World values the wealthy, the beautiful, and the powerful. May this never be true in the Church of Jesus Christ. Each person has been created purposively with great potential by God. It is not the purpose of the body of Christ to downgrade or place on the sidelines any member. Rather we need to celebrate each person whom God sends into our communities as a gift from God. It is crucial that those with more visible roles publicly value those who do not and model humility and a proper sense of balance in the way that they interact with others. The leadership of a community can destroy any chance for the full participation of whole body if it explicitly or implicitly gives the impression that it is the most important component. When I read the Scriptures, I do not get the sense that every follower of Christ looks, talks, and acts in the same fashion. For too long, communities of faith have operated by plugging people into programs. This amounts to making clones of people. The above texts speak of a plurality of gifts. Yet in our drive for organization we often domesticate the unique gifts and talents of people to make them fit our programs and our perceptions. What if instead of forcing members to fit our Church, we instead made it a core value to expand our vision for the community by reorganizing ourselves so that each person’s gifts, talents, and passions could be fully unleashed and utilized in a way that glorified the Giver of All Gifts. How would our communities of faith be different? Every person longs to be part of a community where they are loved authentically and invited to use their gifts, talents, and passions for something bigger than themselves. God gives gifts to communities of faith. What do all of these gifts have in common? They are people. What if every community of faith valued each person who entered its doors? What if this valuing was not based on how much money a person could provide to fund a program or on how well a person would fit in to current ministry offerings? Gifts are for serving others and building up the faith of others. The deployment of gifts is not for self-glorification, but for the praise of God and for the mutual benefit of all. The offering of our gifts, talents, and passions for the good of the whole is part of our being shaped in the image of Jesus who “came not be served to serve and give his life as a ransom for many” (Mark 10:45). The greatest of all gifts is love. This is not a sentimental, fleeting feeling, or a flippantly offered “I love you” but a love that embodies commitment, faithfulness, and a desire for authentic relationship with others. It is a love backed by action. Love is the distinctive mark of the Christian community. It is the tangible evidence of God’s presence. Apart from love the deployment of gifts often turns into opportunities for self-aggrandizement and fulfillment. As Peter says above, “Love covers over a multitude of sins.” No community is perfect. Our own brokenness often causes injury to others in our community, but in a community in which God’s love is authentically embodied, God can take all of the brokenness of each member and craft us into a masterpiece – a mosaic of transformed persons who have turned from self to God and others. Love creates an atmosphere of safety in which God through the Spirit can work powerfully to shape each of us into the people that he created us to be and to invite others to become part of the movement of followers of Jesus Christ. These texts may offer a false impression if not read missionally. On the surface, most of these passages offer the impression that gifts are purely for the "good" of the body. On one level this is true: When the body operates up to its potential, things happen. Community grows. Prayers are offered. Members are unleashed. People discover their true humanity. But on the other hand, a healthy, vital, and vigorous body serves as a profound witness to the world. The biggest mistake that we make as followers of Christ is to believe incorrectly that visible acts of love in the world and evangelism are gifts that God gives only to certain parts of the body. This belief has hamstrung the movement of Jesus Christ as much as any heresy. The mandate for all believers is to MAKE DISCIPLES (Matt 28:18-20). Each follower of Jesus Christ needs to live a missional lifestyle. The power of the whole body working efficiently has its full impact when new persons enter our faith communities and encounter God working among us! What would it look like for my community of faith to embody such a vision? How would we have to change? What would it mean for me personally to live in such a community? What kind of person do I need to become? What if following Jesus Christ were the way to unleash all of the gifts, talents, and passions that God has implanted in us? John baptizes Jesus in the Jordan river. This action serves a couple of functions in Matthew’s Gospel. 1) It is a transition point from John’s ministry to Jesus’. 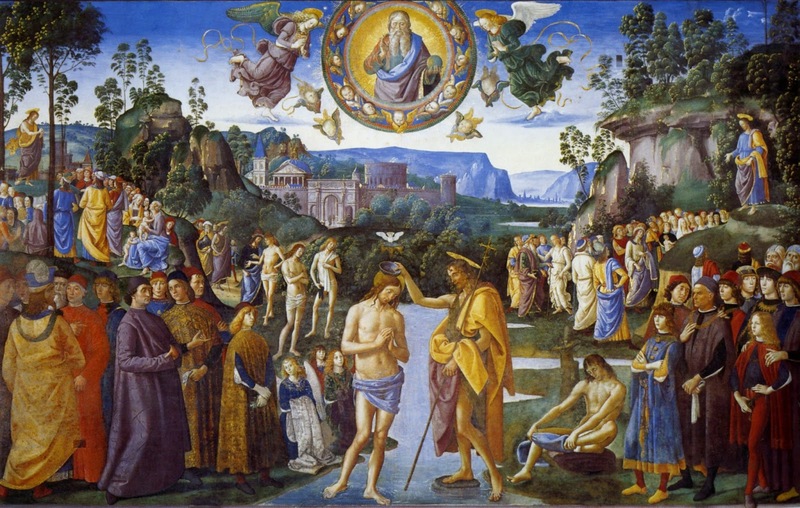 If John represented the consummate OT prophet, Jesus’ baptism marks the end of one epoch and the beginning of the new age of salvation that Jesus has come to initiate. 2) It also affirms a continuity between the actions of John and of Jesus. Both figures serve in the divine mission of bringing salvation. Therefore, you kings be wise; be warned you rulers of the earth. Kiss his son, or he will be angry and you and your ways will be destroyed, for his wrath can flare up in a moment. First, by God invoking Ps 2 in his blessing of Jesus’ baptism, God is asserting that he is reinaugurating his rule through the person of Jesus who is his Christ, i.e., the anointed human ruler. Second, the international flavor of Ps 2, that is its insistence that the scope of God’s Christ’s rule is inclusive of the nations, points to the cosmic significance of Jesus. Jesus’ mission is not limited to the restoration of Israel. Jesus’ mission will have implications for the global community of nations. Jesus is God’s spirit filled servant who will usher in the new age of salvation. Isaiah 42 is powerful because like Ps 2 it likewise has a cosmic scope in its portrayal of God’s plan of salvation. The servant will be empowered to bring justice to the nations (42:1)…He will not falter or be discouraged till he establishes justice on earth (42:4)…[God] will keep and make [him] to be a covenant for the people and a light for the Gentiles (42: 6). This is what God the LORD says—he who created the heavens and stretched out the earth with all that springs from it, who gives breath to its people and life to those who walk on it. The Creator has sent his Son, his human respresentative to usher in a new age of salvation that will bring to fruition God’s desire to extend salvation to all of humanity. Jesus, the Son, is God the Father’s authorized agent of all of this. His baptism marks the public affirmation of this mission. If Jesus’ baptism was marked by a sense of the cosmic implications of his coming work, what would it look like for our communities of faith to see our own work as Jesus followers in the same light? Isn’t it time to recapture mission as the center of our communities? Let your name be holy. Let your will become [reality] on earth as it is in heaven [already]. Give to us today our food for the day. Forgive us our debts just as we ourselves have forgiven our debtors. Don’t lead us into temptation, but deliver us from the evil one. What does this text assume to be true? What does this prayer suggest about God? What does this prayer believe to be true about us? Assumes that prayer is a community activity. This does not mean that one always has to pray in the company of others (Jesus’ instructions in 6:5-8 suggest both individual and corporate prayers), but it does force the pray-er to reflect on the meaning of “our.” God is never simply “my father” or “his father” or “her father” or “their father”; God is our father. Assumes a relational framework. Many of us are turned away from addressing God as “father” because of our own experiences within our families. But Jesus’ model is supposed to be read as an invitation to participate in God’s family. We embody this ethos when we value community and experience authentic relationship with God. God doesn’t merely relate as “our father”. God relates as “Our father who is in heaven.” In other words, this clause distinguishes God as unique among fathers. This address is then followed by three petitions addressed directly to God. All of these are requests for God to usher in fully the promised new reality of an age of salvation. Yet implicit in each request is a bold and daring shift in the pray-er’s own allegiance. To pray each petition is to invite God to work in our lives so that each pray-er begins to embody the values of God’s reign that adumbrate the new age that is coming through the life, death, and resurrection of Jesus the Messiah. 1) Let your name be holy. God’s name is holy. This is a request for the day in which God’s holiness and majesty will be fully and rightfully acknowledged by all creation. It is a commitment to show God’s name holy in the present through the sort of life that we live. 2) Let your kingdom come. Jesus came to announce the age of salvation—the kingdom of heaven (4:17). This is a plea from a pray-er fully aware of the frailty of the present age. Jesus has ushered in the first fruits of the future, but there is more to come. It is a prayer for God to consummate his kingdom in its totality. As this petition is prayer, the pray-er is also committing himself or herself to the values and ethos of the kingdom as taught and lived by Jesus. Jesus’ followers are to live as people from the future who leave clues for those longing for a better life. 3) Let your will become [reality] on earth as it is in heaven [already]. This request fill outs the previous two. What does it look like for God’s name to be recognized as holy and for God’s kingdom to come? God’s will and intentions will be manifest in the totality of his creation. The ethos of the Kingdom of heaven will be the ethos on earth. Of course, to pray this line is to commit oneself to living out God’s will in the present in anticipation of God’s decisive action. The prayer ends with three requests on behalf of the pray-er. These serve as prayers for persons whose lives involve the mission of God. Implicit in each request is profound trust in and recognition of God as the source of life, protection, and salvation. Also each request is also a commitment to embody the very thing that it requested. This is a simply request for food for the day. Life starts and stops here. We begin to embody this value however through becoming generous people. To receive from God is to give to others. Forgiveness is the key to community and maintaining genuine and life-changing relationships. It is vital to read this request for forgiveness from God as a commitment to practice and model forgiveness within the community of faith as well as toward those outside of the community. To follow Jesus is to participate actively and fully in God’s mission. Jesus did not come to create a static or stationary institution. He came to unleash a movement that would embody the ethos of God’s kingdom and carry its message to the ends of the earth. To live this way is to live dangerously. Thus, one must pray a prayer of protection for deliverance from the evil one (the Devil) and from temptation. Why do we need to pray this prayer with audacity and faithfulness? Because God desires to imprint his character on us so that we can leave his fingerprints and handprints in the world to serve as clues for others? God doesn’t need us to make a “difference in the world” but to make the world different. God imprints us so that we can leave his imprint on others. Are you the type of woman or man who can pray the Lord’s Prayer? Or better, do you want to be the type of man or woman who can pray the Lord’s Prayer and embody it? 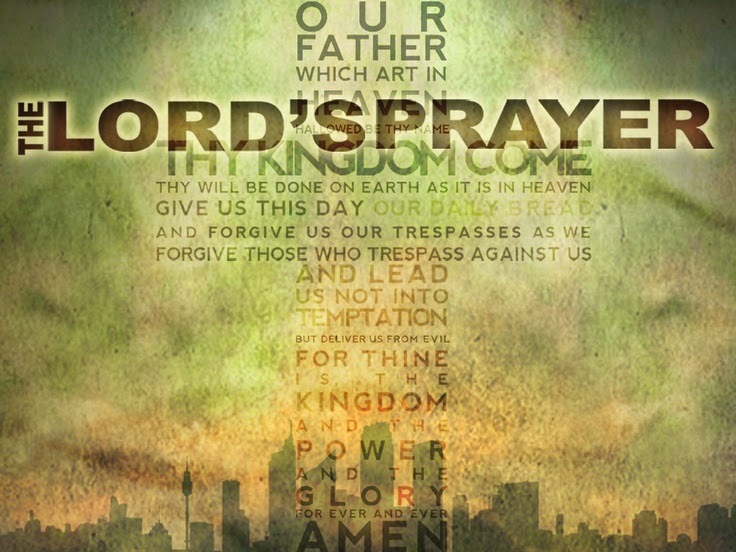 What would your life look like if you prayed the Lord's Prayer as truly lived it out? Read Part one: Praying Audaciously: (re)Learning to Pray the Lord's Prayer. What does it mean to pray audaciously? “Audacity has made kings.” Unknown. All of these quotations would fit well into a motivational speech. When we think of leaders, a spirit of audaciousness and boldness is often found in persons who perform at high levels. But audaciousness sounds awkward in the context of prayer, doesn’t it? But why? Have we so domesticated prayer that we now miss its raw power as the audacious communication of created beings with their Creator? I want to suggest that this prayer is not a piece for rote memory and mindless repetition as it is so often reduced in our communities of faith. Instead this pray is an invitation to a life of audacious petition and conversation with God. What kind of person does God imagine me to be by inviting me to say this prayer? What sort of person do I need to become to pray this prayer? What does it say about God that He invites us to pray this prayer? Jesus began his public ministry with the announcement: Repent for the kingdom of heaven is at hand. (Matt 4:17). In other words, the essential core of Jesus’ message is a call to (re)align with the new age of God’s mission to bring recreation and renewal to His Creation. Jesus offers this prayer as a new prayer for a new day. Jesus is looking for persons to serve as his disciples. This prayer points to the ethos of the kingdom that he is inaugurating through his life, death, and resurrection. This prayer is not about impressing others with eloquent words or babbling on incessantly as though rhetoric and many words could manipulate or force God into action. Rather this prayer models a bold and direct (even audacious) approach to prayer with God. Jesus is looking to build a movement that will change the world. It begins with changed disciples--disciples who have been shaped and molded into disciple makers. Audacious prayer is needed for followers of Jesus to be shaped into the world changers that God seeks to unleash. The prayer Jesus gave to his disciples assumes a familial or relational view of God. God is a "father" rather than a despot, Lord, prince, rock, generic god, etc. The prayer that Jesus gives his followers assumes community. It's our father and not "my" "his" "hers" or "yours." Ponder this deeply. The prayer Jesus teaches is one that boldly asks for God to act to consummate his Kingdom fully. The prayer Jesus teaches assumes that its pray-ers desire to live and embody God’s kingdom so that God can manifest His name through them. The prayer Jesus teaches assumes that God cares about the basic needs of those who seek to live for God’s kingdom. This includes the base line provisions for the day—namely food. The prayer assumes that God desires to guide and protect God’s people from temptation and that God’s people actively resist entering into temptation. “Audacious prayer, which perseveres unflinchingly and ceases not through fear, is well pleasing unto God,” wrote Luther. Are we ready to pray audaciously to the God who loves us and steadfastly acts for our greatest good? Jesus begins his public ministry by preaching, "Repent for the Kingdom of Heaven is near" (Matt 4:17). Many students of Matthew's Gospel consider 4:17 "From this time on Jesus began..." as a major heading for the middle portion of the Gospel (4:17-16:20). Careful readers will note that 16:21 begins in identical fashion: From this time on Jesus began.... Thus, 4:17 is not only a snippet from the preaching of Jesus but also a heading for the presentation of Jesus' public ministry in Matthew's Gospel. This raises a number of questions for us. What is the meaning of Jesus' sermon "Repent for the Kingdom of Heaven is near"? How does it function as a general heading for Jesus' ministry? Why does Jesus begin his ministry in this fashion? I cannot answer these questions exhaustively, but let us begin by breaking down the passage itself. The central exhortation is Jesus' call for repentance. Repentance involves changing or turning. It is a radical "about face" in one's life. I think that a better way of expressing "repent" is to use the word "realign." Jesus is calling for conversion. When he proclaims the good news of the kingdom, it is imperative for his hearers to align or realign themselves with the values and ethic of God's kingdom. Often times this text is misread as a one time event in a person's life. Repentance is typically associated with a person's conversion experience. This is certainly true, but it misses some of the force of this text. This text does not exhort a one time "Repent" but rather it could accurately (although somewhat clumsily) "Be repenting" or "Repent continuously." In the Greek, the verb is in the present aspect which suggests that this verbal form carries on-going/durative force. This is an important observation because it suggests that repentance or realignment is a way of life for a follower of Jesus rather than one time event or precondition for salvation. It is also worth observing that our text does not indicate of what one needs to repent. I think that this carries two implications. First, Jesus' call to repent is comprehensive. Second, what it means to repent can only be discovered by reading further into Matthew's Gospel. In other words, following Jesus involves a continual willingness to realign one's life with the ethos of the Kingdom of heaven. Instead of giving specific directions on repenting/realignment, Jesus provides a single rationale for his exhortation "for the Kingdom of heaven is near." This clause however has much that needs to be unpacked. First, the phrase “kingdom of heaven” is synonymous with the more common “kingdom of God” which is found throughout the other three Gospels. “Kingdom of heaven” is a distinctive of Matthew’s Gospel. Matthew routinely makes use of indirect ways for referring to God. Many scholars attribute this phenomenon to Matthew’s Jewish-Christian audience, which would have been used to such efforts to avoid taking God’s name in vain per the Ten Commandments. Second, “Kingdom” may perhaps better be translated “reign.” In other words, it is a more dynamic term that the static term “kingdom” suggests. It is the active realm of God’s rule. It is the long awaited age of salvation previewed in the proclamation of Israel's prophets. It is the sphere in which God’s will is done “on earth as it is in heaven” as the familiar language of the Lord’s Prayer says. The power in the phrase “Kingdom of heaven” comes as one attempts to flesh out or define the ethos implicit in this. The phrase “Kingdom of heaven” begs at least two questions: What sort of King? What sort of kingdom? This would have been a burning question for the hearers of Jesus who were all too well acquainted with powers, kings, and kingdoms of the world. 1) Jesus came to bring salvation. From the report of his birth to his death and resurrection, the mission of Jesus was “to save his people from their sins” (1:21). 2) Jesus expanded the reach of God’s grace. By “expanded” I am by no means suggesting that God was somehow limited in terms of salvation before the coming of Jesus. Rather Jesus incarnated and modeled for God’s people the necessity of moving to a missional engagement model for ministry. With few exceptions, God’s people in the Old Testament embodied a “Come to” missiological practice. In other words, the nations were invited to come to Israel to experience God’s best. Yes, we can point to Jonah and certain oracles in Isaiah to dispute this, but these exceptions point to the reality of an essential “come to” practice in ancient Israel. In contrast, the modus operandi for Jesus was go. Jesus went and sought out lost persons in order to bring them back into God’s fold. After his resurrection, Jesus fully unleashed his disciples to make disciples of all nations. This involves going. What sort of ethic is found in the Kingdom? It is one that subverts the power structures of Jesus’ day. It invites the outsider to the table. Matthew 5:1 Now when he saw the crowds, he went up on a mountainside and sat down. His disciples came to him, 2 and he began to teach them, saying: 3 "Blessed are the poor in spirit, for theirs is the kingdom of heaven. 4 Blessed are those who mourn, for they will be comforted. 5 Blessed are the meek, for they will inherit the earth. 6 Blessed are those who hunger and thirst for righteousness, for they will be filled. 7 Blessed are the merciful, for they will be shown mercy. 8 Blessed are the pure in heart, for they will see God. 9 Blessed are the peacemakers, for they will be called sons of God. 10 Blessed are those who are persecuted because of righteousness, for theirs is the kingdom of heaven. 11 "Blessed are you when people insult you, persecute you and falsely say all kinds of evil against you because of me. 12 Rejoice and be glad, because great is your reward in heaven, for in the same way they persecuted the prophets who were before you. Notice in particular how Jesus subverts power structures but reversing the expectations for who will be considered blessed. In Jesus’ kingdom, it is the downtrodden and excluded who are blessed. Scripture is not glorifying a marginalized life. Instead, Jesus is emphasizing that those in such position are most open to God’s grace because they are desperate for what only God can provide for them. Jesus elevates an ethic of love for God and for others. The verb predicating “The Kingdom of heaven” is provocative. It is in the Greek Perfect tense. I know that most of my readers don’t know Greek, but bear with me. The Greek perfect carries the basic force of completed action with on-going affects into the present/future. In other words, Jesus is declaring that God’s Kingdom has indeed come. Jesus’ ministry involved tangibly demonstrating this truth. Jesus healed the sick, raised the dead, and cast out devils as actions that provided convincing evidence of the presence of God’s kingdom. Yet we have to be careful here because there is a tension present. In the person of Jesus, God has brought near his end time salvation, but at the same time, the present age remains as well. With the advent of Jesus, we live in a time of overlap between the present age and future reign of God. Biblical scholars often talk about the coming of God’s kingdom in terms of a tension between the “already” and the “not yet.” In other words, Jesus inaugurated the reign of God through his life, death, and resurrection, but its full consummation awaits a future date. God’s kingdom is present now wherever and whenever God’s will is done, but there still remains a day in which God will usher in God’s eternal reign and bring an end to the present age. This is the essence of the lines of the “Lord’s Prayer” that read: “Your kingdom come, your will be done on earth as it is in heaven” (6:10). The very fact, however, that Jesus is announcing the reign of God in his person is reason enough for responding to his call for conversion. Anyone who desires to be part of the world as God intended it was to take notice. In fact, from our perspective, this gets at the missiological or missional point of this text. Jesus’ proclamation at its core is a call to conversion. This is the essence of the repent. Jesus is calling everyone to repentance: from the devoutly religious to the most hardened sinner. To the religious he proclaimed: Align your beliefs and practices to what God is doing through Jesus. To those on the outside he issued this invitation: Come and join the new community that God is raising up in our times. When we understand Jesus' first message, we must ask ourselves, "Am I (are we) ready to (re)align with the good news of God's long awaited age of salvation?" For the last decade, I have done much thinking about the essence of leadership—particularly missional leadership. What is it? What does a missional leader do? John Maxwell defines leadership this way: “Leadership is influence. Nothing more. Nothing less.” Influence is a potent term. It captures the essence of leadership. Influence is the ability to persuade or move people or institutions to adopt a certain course of action or to believe certain things to be true. It is also, as Erwin McManus suggests, the ability to change the things that a person cares about. In our context as followers of Jesus, missional relates to those things that resonate with the mission of God. It involves participation in God’s actions in creation. To be missional is to be in tune with and acting upon God’s will “on earth as it is in heaven.” Thus, missional leadership is influence that unleashes others to participate in God’s overarching mission for His Creation. Men and women who serve as missional leaders work to shape and create a mission-centered ethos within their communities. Such an ethos is shaped through language, environment, and actions. We will now explore these three elements. Secular leaders have long recognized the power of language. Bart Nanus in Visionary Leadership , wrote, "There is no more powerful engine driving an organization toward excellence and long-range success than an attractive, worthwhile, and achievable vision of the future, widely shared." Missional leaders deploy the power of language to invite people to live in a new land—a land that evokes God-sized dreams and is permeated with the love and hope that God unleashed through the life, death, and resurrection of Jesus Christ and through the subsequent outpouring of the Spirit on Jesus’ followers. We, of course, are not describing mere rhetoric—as if human language alone has intrinsic power apart from God. The Bible as the Word of God invites us into this new world as the Scriptures announce to us God’s mission. I am convinced that as interpreters of Scripture we need to think about the overarching story of the Bible. Too often we have a tendency to read the Bible as a collection of fragments whose imagery we can capture for a sermon or time of teaching. Yet, the Scriptures focus on the mission of God (missio dei). Humanity plays a vital role in God’s mission. In God’s original plan, humanity was created to serve as a missional community to reflect God’s character to all creation. Human rebellion (described most poignantly in the narratives of Genesis 3-11 and in Paul’s letter to Rom (Romans 1-3) created the need for God to work profoundly for the reconciliation of humanity. This involved the creation of a new people—Israel through whom God would work to bring salvation to the end of the earth. God’s plan of salvation for humanity reached its climax in the life, death, and resurrection of Jesus the Messiah. Jesus fulfilled all that Israel was to be and unleashed his followers to into the world to share the good news of God’s salvation through the power of the Holy Spirit. The Scriptural story ends where it began—New Creation. Ostensibly, life in the New Creation will be a renewal of the original purposes for humanity—living as a missional community for all Creation by reflecting God’s character to it. The missional leader understands, breathes, and lives for this narrative. She or he uses the power of language to help others to catch a glimpse of what God is doing. The goal of this deployment of language is simple: conversion. The missional leader seeks to establish a missional ethos through language so that followers of Jesus the Messiah may be (re)converted and (re)ignited to God’s mission and so that those non-Christ followers may be invited to live for God’s mission receiving the gift of life that God offers through trusting Jesus Christ. Designers of missional worship services need to maneuver skillfully between two false temptations. The first temptation is a stodgy allegiance to a traditional liturgical service. Traditionalists tend to forget that every tradition began as a contemporary and fresh expression of worship in some context. It is simply wrong-headed to think that an orthodox theology will translate only into one type of worship. The second temptation is to overemphasize “edginess” as evidence of missional zeal. It is a fine line between seeking to speak clearly and relevantly to a target audience (or as I like to say “to speak human”) and losing the essence of the Gospel. Here are a couple of thoughts about shaping environment. 1) Prayer—Never underestimate the importance and power of prayer. Missional communities resonate with God through prayer. Leaders must lead from their knees. The creation of environments must be birth in prayer and sustained by the prayers of the missional leaders and their communities of faith. There is no substitute for this step. 2) Scripture—The Bible offers to its readers a new world. It is an invitation to experience a new life and to live the reality of New Creation in the present. Missional leaders understand that communities of faith need to be saturated with Scripture. The Bible is the most profound book that humanity possesses. Missional communites need to rediscover its power and its ability to shape and create ethos. 3) Deploy Gifts Openly—Missional leaders push their communities to grow in grace and Christlikeness by celebrating and deploying the gifts of the body. Many emerging Churches have rediscovered the power of art in worship. Dance, music, painting, video, and drama are becoming increasingly common in worship gatherings in missional communities in the Western world. These features push followers of Christ to use their own gifts. For too long, Christian artists have been held at arm’s length by the Church. This has harmed the Christ following movement because it has stifled the creativity of community as the whole. Any time that a person’s gifts and talents are squelched the body of Christ is harmed. Missional communities need every single Christ follower functioning fully. Deploying gifts in the context of worship encourages others to use their own gifts for the good of the whole. Missional leaders must learn to sculpt the ethos of their communities of faith. We have already looked at the potential of deploying language and creating environments that reflect a biblical ethos. The missional leader can also shape ethos through his or her actions. This may ultimately be the greatest shaper of ethos. What does a radically inclusive ministry look like? a) It empowers women for leadership roles. I fully understand that the evangelical world is divided over this issue, but I am convinced that the biblical witness supports the full inclusion of women in leadership roles within the Christ-following movement. This is not the place for a full defense of this position, but I am convinced that this needs to be part of our witness to the culture. b) It rejects divisions along socio-economic lines. Missional leaders are willing to pay the price to allow the active participation of poor and rich alike within their communities. James 2 gives stern warnings about acting otherwise. As the world becomes increasingly urbanized, we will continue to witness extreme poverty. If the Christ-following movement is to ever have a global impact, it needs to begin serving the poor in their own geographic locales. c) It develops cross cultural and interracial friendships as the presupposition for the creation of multi-cultural communities that give the world a taste of the diversity of Kingdom of God. Too many leaders lament the segregation of communities of faith, but miss the irony that the basis for desegration is not lament but the active embrace of persons different from ourselves. We need to cultivate friendships and relationships with persons from backgrounds unfamiliar to us. An inclusive ministry is the pathway to unleashing followers of Christ to deploy fully their giftedness. 3) The missional leader can shape ethos by empowering others to serve according to their giftedness. The biblical portraits of gifts (e.g., Romans 12 or 1 Corinthians 12-14) suggest that the body of Christ is a living organism in which each member has a crucial role to play. The people of God need one another. Biblical community occurs when each believer deploys his or her gifts, talents, and passions within the community. The missional leader will work to shape the ethos of the community by (re)implementing a biblical vision of the God’s people by empowering followers of Christ to unleash the full range of their giftedness and the natural result of their relationship with Jesus Christ. Missional leaders rather than being the driving force of every discrete ministry within a community will serve as coaches who train, empower, and encourage followers of Christ in their Kingdom work. 4) The missional leader can shape ethos by a commitment to living a whole and balanced life as a follower of Jesus Christ. Human beings were created to live in authentic community in which they reflect God’s character to the world. Community, holiness, and mission are the essence of the imago dei in humanity. Missional leaders need to reflect these aspects in their own lives. The persons who listen to us and watch us will be persuaded most readily by a life that they would want to live. Following Jesus Christ is not about prosperity or material happiness, but it comes with a joy and fulfillment that cannot be attained by any other means. If we are to shape a biblical ethos for our communities, we ourselves as missional leaders must live whole and balanced lives before our communities. If you enjoy this essay, subscribe to the blog and never miss another post. If you are looking for a resource to create a missional DNA in your community of faith through the study of Scripture, check out Invitation. The goal of interpretation is the conversion of the reader/audience to the message of the biblical text. This involves a continuous realignment with God’s mission as part of a missional community that reflects God’s character to/for/in the world. 1) Focused attention must be given to discerning the original application present in the text under consideration. This step serves as a guide to thinking through the application of the text in contemporary communities of faith. To whom was the message of the text directed? The faith community, individuals or groups outside of the community, all of the above? What assumptions does this text make about its audience? What kind of world does this text imagine to be true for its audience? What effect did this text intend to have on its audience? Is there any evidence in the text that would limit its application in any way? 2) Reflect Critically on the Message of the Text in Light of the biblical Canon. How does our text fit into the overarching narrative of the Bible (Creation – Fall – Israel – Jesus the Messiah – Church – New Creation? How do the messages of the OT and NT affirm, challenge, nuance, or bring additional light to the message of our text? 3) In light of ##1 and 2, synthesize the key message of our text. 4) Appropriate the Text for a 21st Century Audience. The biblical interpreter of today must refuse the privileged position of preaching to the choir or simply pointing out to audiences interesting facts/insights about the Bible. The goal of the biblical Gospel is conversion. The text calls all its hearers to align or realign themselves with the mission of God in the World. It speaks to both insiders (Christ-followers) and outsiders (non-Christ followers). Outsider: What sort of world is this text inviting me to spend my life working to create? What would my life look like if I joined this mission? Insider: What does this text tell us about the character or ethos of God’s people? What are God’s people supposed to become? How do God’s people need to change in order to more profoundly reflect the character of God? What sort of person do I need to become in order to live out this text? Outsider: What type of lifestyle/character is this text inviting me to embody? How would my life be enriched by aligning my character with the vision of this text? Outsider: What type of community is this text inviting me to explore? How is this text inviting me to participate in a community that exists for something greater than my own wants and desires? Missional Insight (Head/Thinking): How does this text challenge me to think differently? Attitude Alignment (Heart/Deep Surrender/Will): How do I need to (re)align my heart or what I care about? Plan of Action (Hands/Feet/Mouthpiece): What specific actions do I need to take or rituals do I need to practice to embody the message of this text? Remember that we must call our hearers (including ourselves) to a whole person response (head/heart/hands). This must involve action. To see a practical application of this method, check out my resource for small groups Invitation. This study presents the overarching biblical narrative in a way that emphasizes mission, community, and holiness. It is100% designed and written for anyone interested in the Bible (Christian or not). Pastors and teachers will want to know that my full blown text book on missional hermeneutics is now available: (re)Aligning with God: Reading Scripture for Church and World .